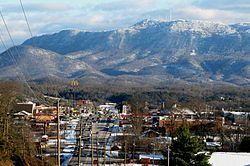 Area Ranked 36th in the U.S.
Population Ranked 17th in the U.S.
Tennessee ( /tɛnɪˈsiː/) (Cherokee: ᏔᎾᏏ, Tanasi) is a U.S. state located in the Southeastern United States. Tennessee is the 36th largest and the 17th most populous of the 50 United States. Tennessee is bordered by Kentucky and Virginia to the north, North Carolina to the east, Georgia, Alabama, and Mississippi to the south, and Arkansas and Missouri to the west. The Appalachian Mountains dominate the eastern part of the state, and the Mississippi River forms the state's western border. 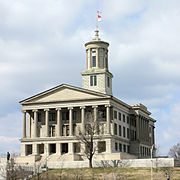 Tennessee's capital and second largest city is Nashville, which has a population of 601,222. Memphis is the state's largest city, with a population of 653,450. The Cumberland Plateau rises to the west of the Tennessee Valley; this area is covered with flat-topped mountains separated by sharp valleys. The elevation of the Cumberland Plateau ranges from Template:Convert/to about above sea level. East Tennessee has several important transportation links with Middle and West Tennessee, as well as the rest of the nation and the world, including several major airports and interstates. Knoxville's McGhee Tyson Airport (TYS) and Chattanooga's Chattanooga Metropolitan Airport (CHA), as well as the Tri-Cities' Tri-Cities Regional Airport (TRI), provide air service to numerous destinations. I-24, I-81, I-40, and I-75, along with numerous state highways and other important roads, traverse the Grand Division and connect Chattanooga, Knoxville, and the Tri-Cities, along with other cities and towns such as Cleveland, Athens, and Sevierville. Fifty-four state parks, covering some 132,000 acres (534 km2) as well as parts of the Great Smoky Mountains National Park and Cherokee National Forest, and Cumberland Gap National Historical Park are in Tennessee. Sportsmen and visitors are attracted to Reelfoot Lake, originally formed by the New Madrid earthquake; stumps and other remains of a once dense forest, together with the lotus bed covering the shallow waters, give the lake an eerie beauty. Summers in the state are generally hot and humid, with most of the state averaging a high of around 90 °F (32 °C) during the summer months. Winters tend to be mild to cool, increasing in coolness at higher elevations. Generally, for areas outside the highest mountains, the average overnight lows are near freezing for most of the state. The highest recorded temperature is 113 °F (45 °C) at Perryville on August 9, 1930 while the lowest recorded temperature is −32 °F (−35.6 °C) at Mountain City on December 30, 1917. While the state is far enough from the coast to avoid any direct impact from a hurricane, the location of the state makes it likely to be impacted from the remnants of tropical cyclones which weaken over land and can cause significant rainfall, such as Tropical Storm Chris in 1982 and Hurricane Opal in 1995.Template:Tropical Cyclone Rainfall in the Southeastern United States The state averages around 50 days of thunderstorms per year, some of which can be severe with large hail and damaging winds. Tornadoes are possible throughout the state, with West and Middle Tennessee the most vulnerable. Occasionally, strong or violent tornadoes occur, such as the devastating April 2011 tornadoes that killed 20 people in North Georgia and Southeast Tennessee. On average, the state has 15 tornadoes per year. Tornadoes in Tennessee can be severe, and Tennessee leads the nation in the percentage of total tornadoes which have fatalities. Winter storms are an occasional problem, such as the infamous Blizzard of 1993, although ice storms are a more likely occurrence. Fog is a persistent problem in parts of the state, especially in East Tennessee. Capital punishment has existed in Tennessee at various times since statehood. Prior to 1913 the method of execution was hanging. From 1913 to 1915 there was a hiatus on executions but they were reinstated in 1916 when electrocution became the new method. From 1972 to 1978, after the Supreme Court ruled (Furman v. Georgia) capital punishment unconstitutional, there were no further executions. Capital punishment was restarted in 1978, although those prisoners awaiting execution between 1960 and 1978 had their sentences mostly commuted to life in prison. From 1916 to 1960 the state executed 125 inmates. For a variety of reasons there were no further executions until 2000. Since 2000, Tennessee has executed six prisoners and has 73 prisoners on death row (as of April 2015). Lethal injection was approved by the legislature in 1998, though those who were sentenced to death prior to January 1, 1999 may request electrocution. In May 2014 the Tennessee General Assembly passed a law allowing the use of the electric chair for death row executions when lethal injection drugs are not available. The Mississippi Band of Choctaw Indians is the only federally recognized Native American Indian tribe in the state. It owns 79 acres (32.0 ha) in Henning, which was placed into federal trust by the tribe in 2012. This is governed directly by the tribe. ^ a b c "Table 1. Annual Estimates of the Resident Population for the United States, Regions, States, and Puerto Rico: April 1, 2010 to July 1, 2014" (CSV). U.S. Census Bureau. January 2, 2015. http://www.census.gov/popest/data/state/totals/2014/tables/NST-EST2014-01.csv. Retrieved January 2, 2015. ^ "Annual Estimates of the Resident Population for Incorporated Places: April 1, 2010 to July 1, 2013" (CSV). 2013 Population Estimates. United States Census Bureau, Population Division. January 2, 2015. http://www.census.gov/popest/data/cities/totals/2013/SUB-EST2013-3.html. Retrieved January 2, 2015. ^ a b Tennessee's Civil War Heritage Trail. Retrieved: November 25, 2009. Archived December 8, 2013 at the Wayback Machine. ^ "Tennessee State Library and Archives FAQ". Web.archive.org. Archived from the original on October 23, 2004. http://web.archive.org/web/20041023191026/http://www.state.tn.us/sos/statelib/pubsvs/faq.htm#01. Retrieved July 31, 2010. ^ "Tennessee's Name Dates Back To 1567 Spanish Explorer Captain Juan Pardo". Tngenweb.org. January 1, 2005. http://www.tngenweb.org/campbell/hist-bogan/tennessee.html. Retrieved July 31, 2010. ^ "Brief History of Tennessee in the War of 1812". Tennessee State Library and Archives. http://www.state.tn.us/TSLA/history/military/tn1812.htm. Retrieved April 30, 2006. Other sources differ on the origin of the state nickname; according to the Columbia Encyclopedia, the name refers to volunteers for the Mexican-American War. ^ "Elevations and Distances in the United States". U.S Geological Survey. April 29, 2005. http://erg.usgs.gov/isb/pubs/booklets/elvadist/elvadist.html#Highest. Retrieved December 16, 2008. ^ "What's Happening in Nashville". Vanderbilt.edu. http://www.vanderbilt.edu/sociology/VDOS_Nashville.shtml. Retrieved August 7, 2010. ^ "World Map of Köppen−Geiger Climate Classification" (PDF). Archived from the original on January 14, 2009. https://web.archive.org/20090114202025/http://koeppen-geiger.vu-wien.ac.at/pdf/kottek_et_al_2006_A1.pdf. Retrieved December 19, 2008. ^ "A look at Tennessee Agriculture" (PDF). Agclassroom.org. http://www.agclassroom.org/kids/stats/tennessee.pdf. Retrieved November 1, 2006. ^ "US Thunderstorm distribution". src.noaa.gov. Archived from the original on October 15, 2006. http://web.archive.org/web/20061015060809/http://www.srh.noaa.gov/key/HTML/tstmhazards.htm. Retrieved November 1, 2006. ^ "Mean Annual Average Number of Tornadoes 1953–2004". ncdc.noaa.gov. http://www.ncdc.noaa.gov/img/climate/research/tornado/small/avgt5304.gif. Retrieved November 1, 2006. ^ "Top ten list". tornadoproject.com. http://www.tornadoproject.com/toptens/topten1.htm. Retrieved November 1, 2006. ^ "National and Local Weather Forecast, Hurricane, Radar and Report". Weather.com. http://www.weather.com/. Retrieved July 31, 2010. ^ "Tennessee (USA): State, Major Cities, Towns & Places". City Population. February 19, 2011. http://www.citypopulation.de/USA-Tennessee.html. Retrieved July 13, 2015. ^ "Chronology of Emancipation during the Civil War". University of Maryland: Department of History. http://www.history.umd.edu/Freedmen/chronol.htm. ^ "This Honorable Body: African American Legislators in 19th Century Tennessee". Tennessee State Library and Archives. http://www.state.tn.us/tsla/exhibits/blackhistory/timelines/timeline_1861-1865.htm. ^ Allen R. Coggins (January 15, 2012). Tennessee Tragedies: Natural, Technological, and Societal Disasters in the Volunteer State. Univ. of Tennessee Press. p. 158. ISBN 978-1-57233-829-6. http://books.google.com/books?id=SfK6aBuqohQC&pg=PA158. Retrieved November 23, 2012. ^ Resident Population Data. "Resident Population Data – 2010 Census". 2010.census.gov. http://2010.census.gov/2010census/data/apportionment-pop-text.php. Retrieved December 23, 2012. ^ DADE, COREY (November 22, 2008). "Tennessee Resists Obama Wave". Wall Street Journal. http://online.wsj.com/article/SB122731165800249331.html?mod=googlenews_wsj. Retrieved November 23, 2008. ^ "Tennessee QuickFacts from the US Census Bureau". Quickfacts.census.gov. http://quickfacts.census.gov/qfd/states/47000.html. Retrieved July 10, 2013. ^ Brittingham, Angela; de la Cruz, G. Patricia (June 2004). "Ancestry: 2000" (PDF). U.S. Census Bureau. p. 6. C2KBR-35. http://www.census.gov/prod/2004pubs/c2kbr-35.pdf. Retrieved July 31, 2010. ^ Pulera, Dominic J. (2004). Sharing the Dream: White Males in a Multicultural America. New York: Continuum. p. 57. ISBN 0826416438. http://books.google.co.uk/books?id=SVoAXh-dNuYC&pg=PA57. ^ "Ancestry of the Population by State: 1980 - Table 3" (PDF). http://www.census.gov/population/www/censusdata/files/pc80-s1-10/tab03.pdf. Retrieved December 9, 2011. ^ "The Pew Forum on Religion & Public Life". Religions.pewforum.org. http://religions.pewforum.org/maps. Retrieved July 31, 2010. ^ "The Association of Religion Data Archives | State Membership Report". www.thearda.com. http://www.thearda.com/rcms2010/r/s/47/rcms2010_47_state_adh_2010.asp. Retrieved December 12, 2013. ^ "State Data and Comparisons: Tennessee". State Data Lab. Institute for Truth in Accounting. http://www.statedatalab.org/state_data_and_comparisons/detail/tennessee. Retrieved February 26, 2014. ^  Archived January 2, 2009 at the Wayback Machine. ^ "USDA 2002 Census of Agriculture, Maps and Cartographic Resources". Nass.usda.gov. http://www.nass.usda.gov/research/atlas02/index.html. Retrieved July 31, 2010. ^ "A Guide to Tennessee Inheritance and Estate Taxes" (PDF). http://www.state.tn.us/revenue/forms/inhgift/guideinhestate.pdf. Retrieved December 9, 2011. ^ a b Dennis Ferrier (August 18, 2015). "2014 was best year ever for Tennessee tourism". WSMV News 4. http://www.wsmv.com/story/29825403/2014-was-best-year-ever-for-tennessee-tourism. Retrieved August 18, 2015. ^ U. S. Travel Association (2014). The Economic Impact of Travel on Tennessee Counties, 2013. USA: Tennessee Department of Tourist Development. p. 21. http://www.tnvacation.com/industry/sites/default/files/Economic%20Impact%20Report_Travel%20on%20Tennessee%20Counties_2013%20.pdf. Retrieved August 18, 2015. ^ a b c D. K. Shifflet & Associates (2014). 2013 Tennessee Visitor Profile. USA: D. K. Shifflet & Associates/State of Tennessee. http://www.tnvacation.com/industry/sites/default/files/2013%20Tennessee%20Visitor%20Profile.pdf. Retrieved August 18, 2015. ^ Johnny Kampis. "Top Ten Places to Go in Tennessee". USA Today. http://traveltips.usatoday.com/top-ten-places-tennessee-100050.html. Retrieved August 18, 2015. ^ "Court of Criminal Appeals". Tsc.state.tn.us. http://www.tsc.state.tn.us/geninfo/Bio/CrimAppeals/Biocca.htm. Retrieved July 31, 2010. ^ DADE, COREY (November 22, 2008). "Tennessee Resists Obama Wave". Wall Street Journal. http://online.wsj.com/article/SB122731165800249331.html?mod=googlenews_wsj. ^ "Bill Information for SB1774". Tennessee General Assembly. http://wapp.capitol.tn.gov/apps/BillInfo/Default.aspx?BillNumber=SB1774. Retrieved June 1, 2014. ^ a b "Death Penalty in Tennessee". State of Tennessee Dept. of Correction. http://www.state.tn.us/correction/media/deathpenalty.html. Retrieved August 18, 2015. ^ Jim Matheny (May 23, 2014). "Electric chair brings life to old death penalty debates". WBIR/NBC. http://www.wbir.com/story/news/local/2014/05/23/electric-chair-tennessee-haslam/9510473/. Retrieved August 18, 2015. ^ "Death Row Inmates by State". Death Penalty Information Center. April 1, 2015. http://www.deathpenaltyinfo.org/death-row-inmates-state-and-size-death-row-year?scid=9&did=188#state. Retrieved August 18, 2015. ^ Dockterman, Eliana (May 22, 2014). "Tennessee Says It Will Bring Back the Electric Chair". Time. http://time.com/109909/tennessee-brings-back-electric-chair/. Retrieved May 23, 2014. ^ Ghianni, Tim (May 23, 2014). "Tennessee reinstates electric chair as death penalty option". Reuters. http://www.reuters.com/article/2014/05/23/us-usa-tennessee-execution-idUSBREA4M03520140523. Retrieved May 23, 2014. This page uses content from the English language Wikipedia. The original content was at Tennessee. The list of authors can be seen in the page history. As with this Familypedia wiki, the content of Wikipedia is available under the Creative Commons License.